Wall Street banks last fall told Uber that it could fetch a $120 billion valuation in its IPO. What we didn't realize at the time was just how important that specific figure was to Uber CEO Dara Khosrowshahi. 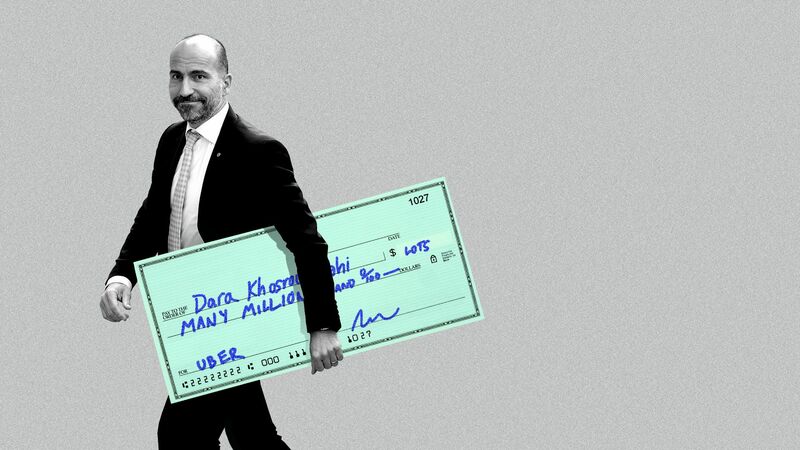 The bottom line: Khosrowshahi stands to make a boatload of money if Uber maintains an average fully-diluted valuation of at least $120 billion during a period of 90 consecutive trading days, according to a footnote in the company's IPO registration document. By the numbers: Specifically, he'd be entitled to stock options to buy 1.75 million shares. The fair market value when those shares began vesting last May was $59 million, but would be substantially higher at a $120 billion valuation (yes, even fully-diluted). For further context, he left over $180 million of options on the table when he left Expedia to take the Uber job. This potential options grant is part of his original employment agreement, not something specifically tied to the IPO. Shot: Just to give Khosrowshahi some heartburn, Lyft shares closed yesterday at $56.11. That's 22% below the IPO price and just 18.5% above the final private share price. Chaser: Just to give Khosrowshahi some antacid, both Zoom and Turning Point Therapeutics this morning increased their IPO size. Neither is a transportation company, but the moves suggest that Lyft hasn't softened the broader IPO market. What to watch: It will be interesting to see if we get an amended filing from Pinterest over the next 24 hours.